RTG’s introduced a glamorous new mobile slot game today called High Fashion. South Africa's Springbok Casino has it already and is offering some nice bonuses to anyone that wants to try it! You may have played High Fashion on your desktop computer and now mobile casino players can enjoy the stylish 25-line slot as well. To mark the launch of the new mobile slot game, Springbok will give you an up to R1500 casino bonus and 25 free spins to take it for a spin. The new tap-and-swipe mobile version of this fashion runway-themed slot game has two bonus features. Model symbols on reels 1 and 5 trigger five free spins loaded with extra wilds. Three or more Runway scatter symbols can also trigger free spins only in these free spins the middle reel is ALWAYS wild. 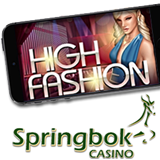 Casino bonus and free spins available now for new High Fashion slot at Springbok Mobile Casino. There are now 25 games in Springbok’s mobile casino for smartphones and tablets.